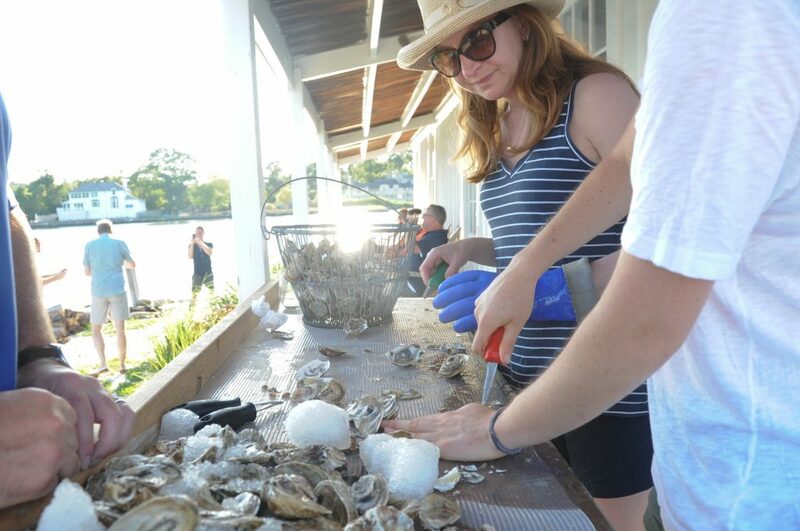 On morning walks in our neighborhood, we’ll often see boats checking in on the oyster beds right off Morningside. 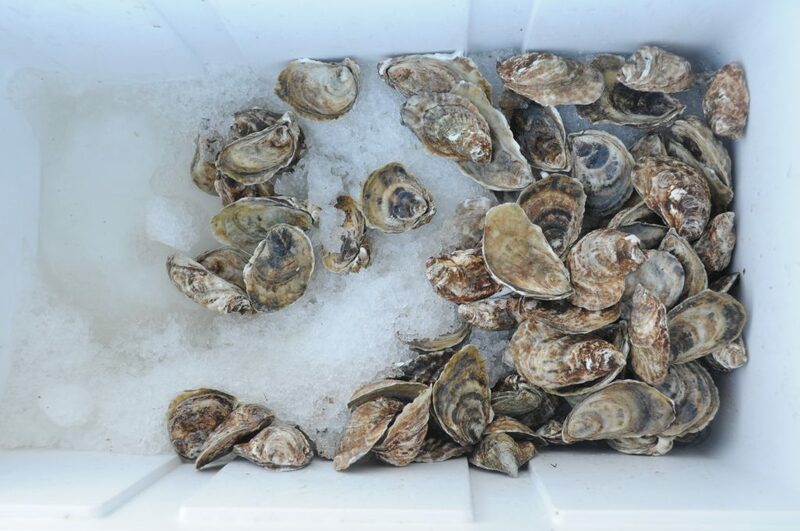 I always wish they would sell those oysters right here in Milford, but we’ve heard these bivalves are started in our area (and finished elsewhere) before going to market. Seeing these flags swaying off the shore has made me curious about how oysters are raised and earlier this summer I saw Hummock Island Oysters was offering tours on its farm in Westport. There was no question we were getting tickets. Our first tour date was cancelled due to rainy weather, but last weekend our tour went off in perfect weather. 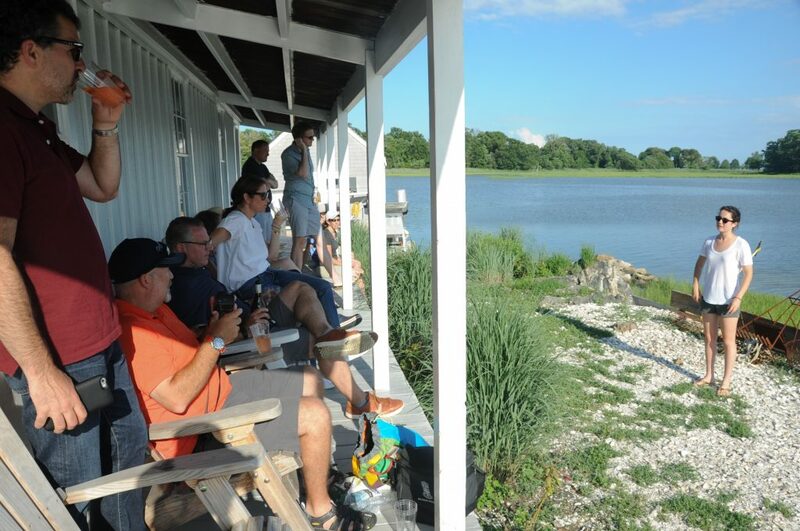 Being out on Hummock Island feels like a relaxing escape – miles away from busy shoreline beaches, the traffic of 95 and the general hustle and bustle of Fairfield County – though we were just barely off-shore. 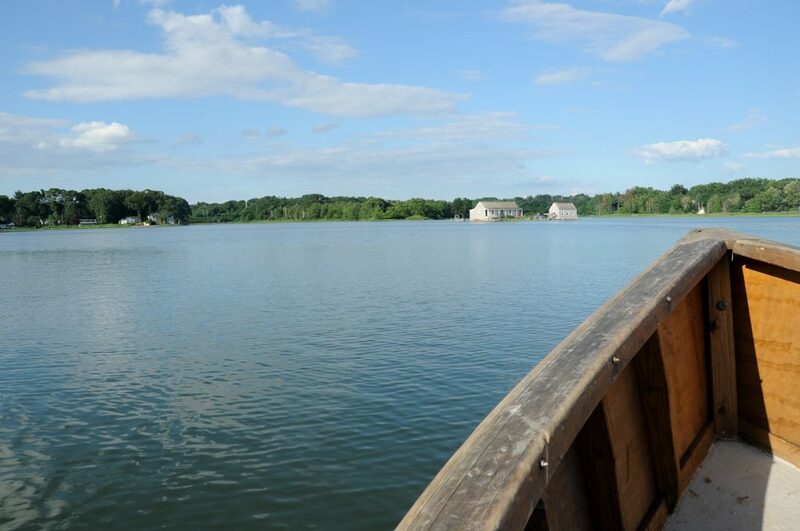 The journey to Hummock Island begins with a short boat ride in the extremely shallow Sherwood Mill Pond. The last resident of the island left a few decades ago, but the island and several acres around it have been in the Northrop family for centuries. Our tour was led by owner Jeff Northrop. 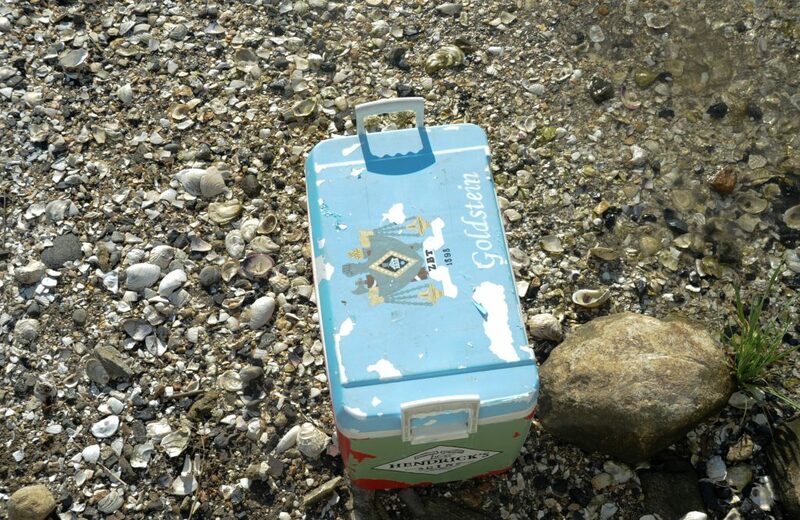 As soon as you arrive, you’re welcome to unpack your cooler! 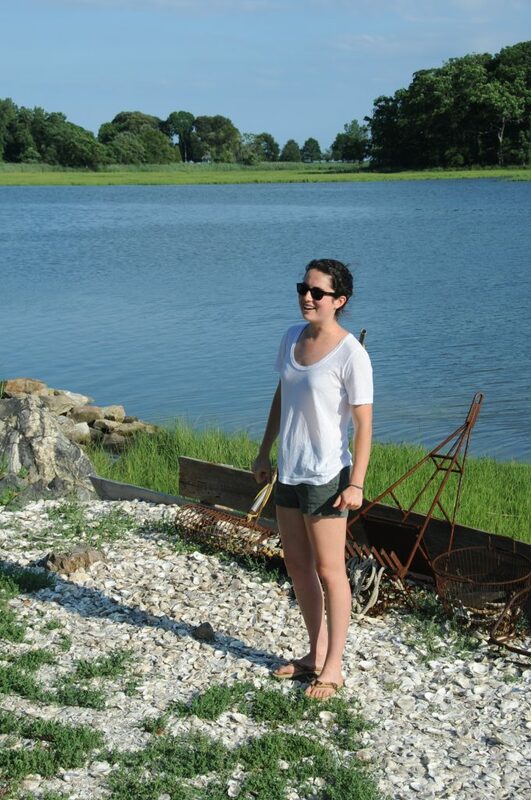 Farm history and oyster farming techniques were explained, while tour guests took in the view from the front porch. 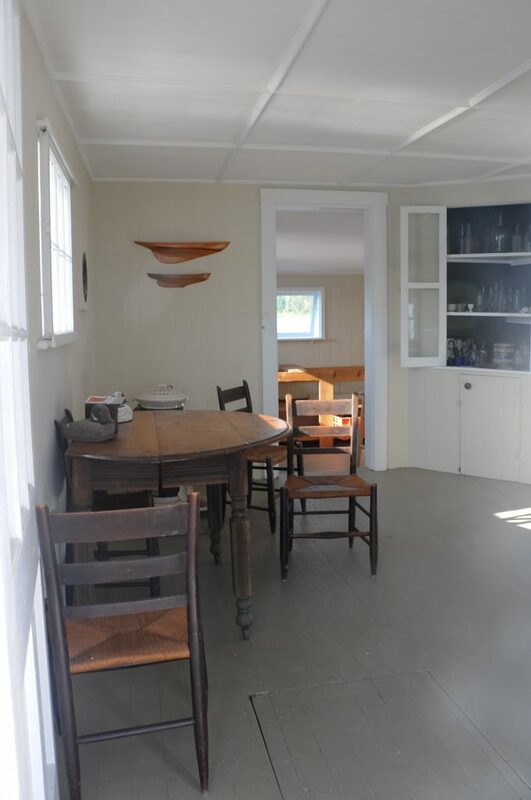 The island house has been recently restored. 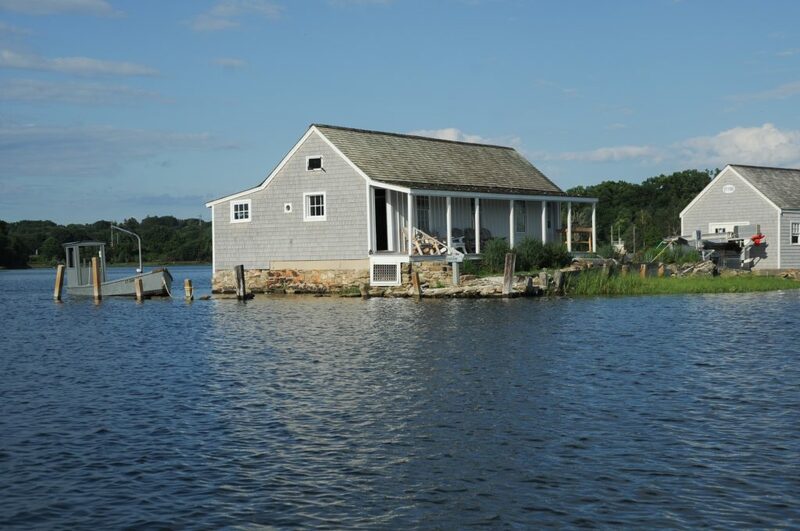 It sustained substantial damage during Hurricane Sandy. 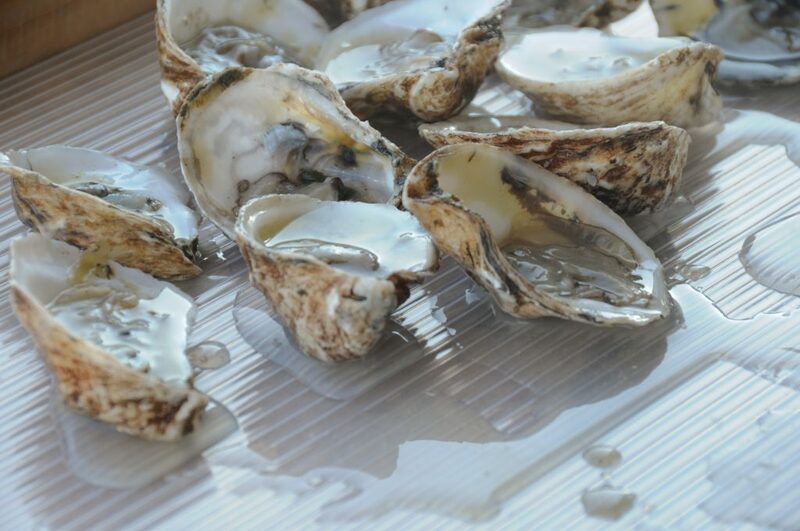 On to my favorite part – the oysters! 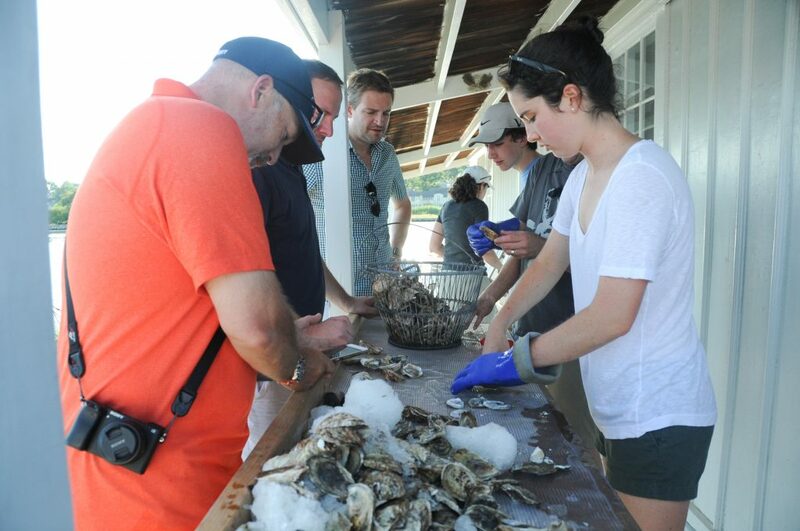 Oh the oysters… and lots of them. 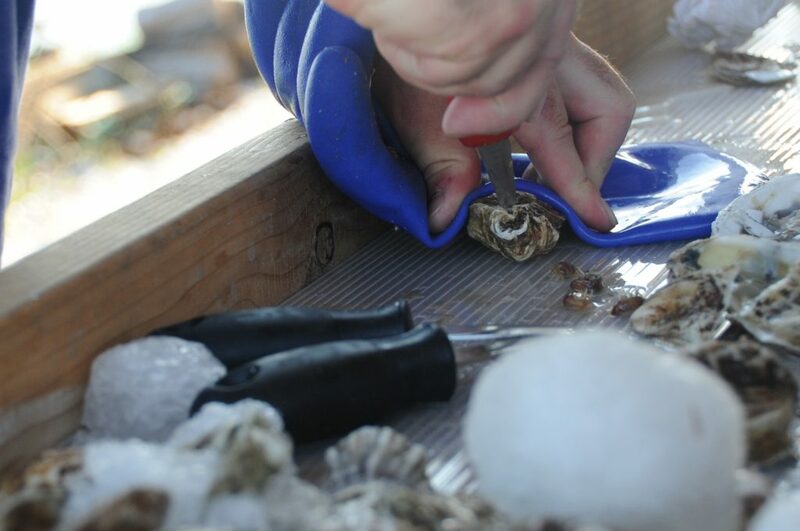 For those new to shucking, you can ask for a lesson and then you’re welcome to give a go at opening your own. Another guest (who traveled from Brooklyn for the tour) mentioned his belief that oysters taste better when you shuck them for yourself. I took this comment as a friendly challenge, put down my camera and bubbly and opened my first (ever) oyster. I was afraid of stabbing myself, but our guide hand picked an easy one for me. This is a wet and somewhat messy affair (qualities I dislike when I’m using my camera), so I went back to taking photos and left the shucking to others, but I’ll agree – interacting with your food source does change your experience. 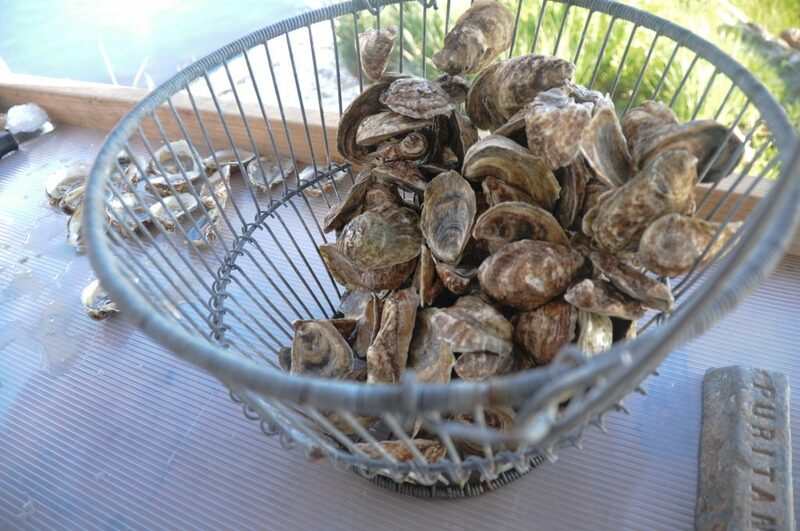 Emboldened a bit by my positive experience, I hope to keep practicing, so I don’t have to rely on my husband (who once worked at a raw bar) to shuck oysters at home. 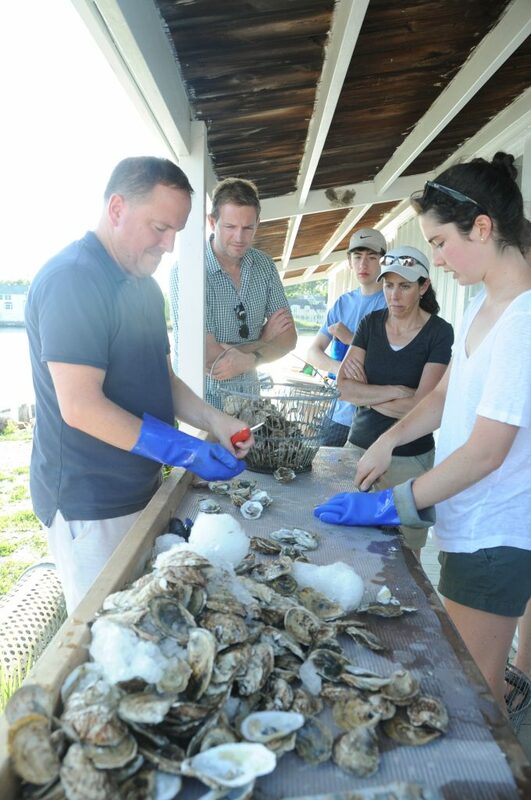 See my husband standing on the outside edge of the shucking table (below)? The back of the table has a raised edge and this side experiences a lot less dripping from melting ice. Just below the front porch you’ll see a the metal cylinder. It’s one of the sorters used in the continual process of sorting. 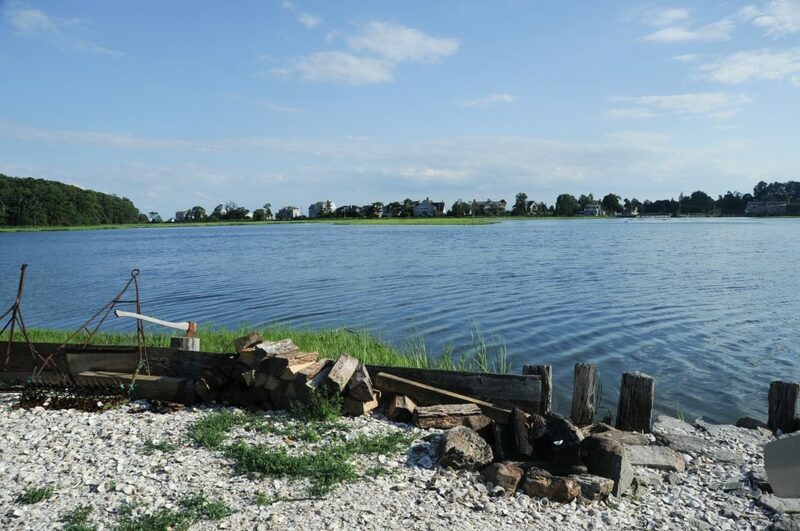 Hummock Island oysters are grown from seed, sorted to similar size and primarily raised in this tidal pond. 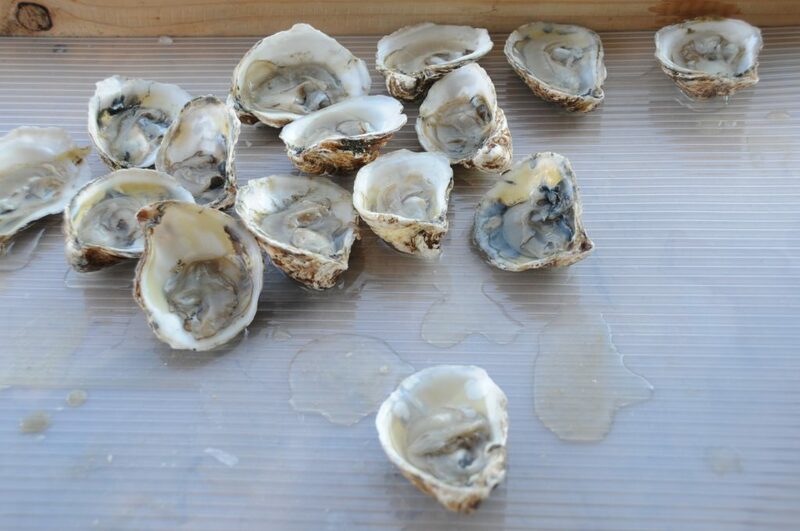 These oysters are (currently) finished nearby in the Long Island Sound. 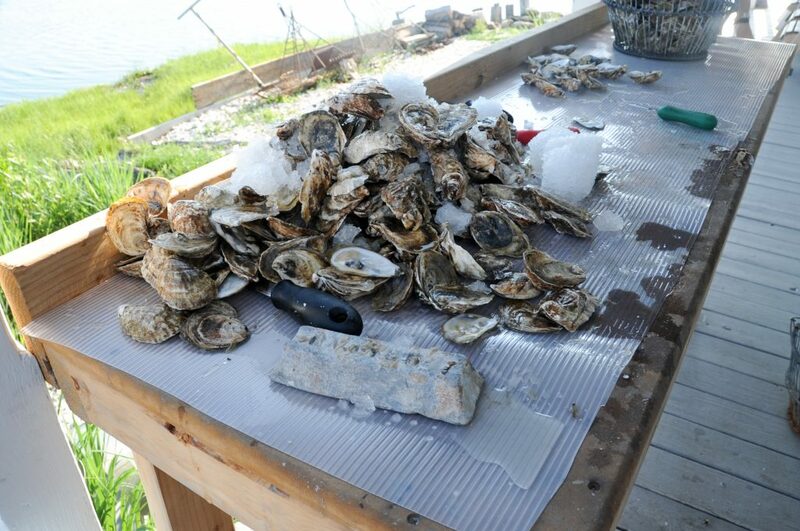 Market size is 3″ oysters, in the shell. 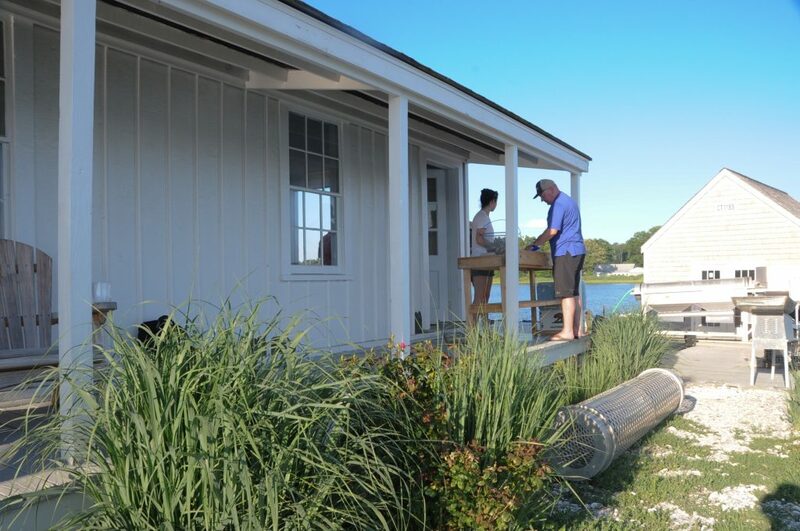 I had never noticed the Hummock Island house before and was there only to eat and learn about oysters, but on our tour I got the sense that some guests came moslty for a chance to peek inside the island house and experience Westport from a difference vantage point. Regardless of your reasons, the setting for this farm is undeniably beautiful, especially from one of the Adirondacks on the front porch. 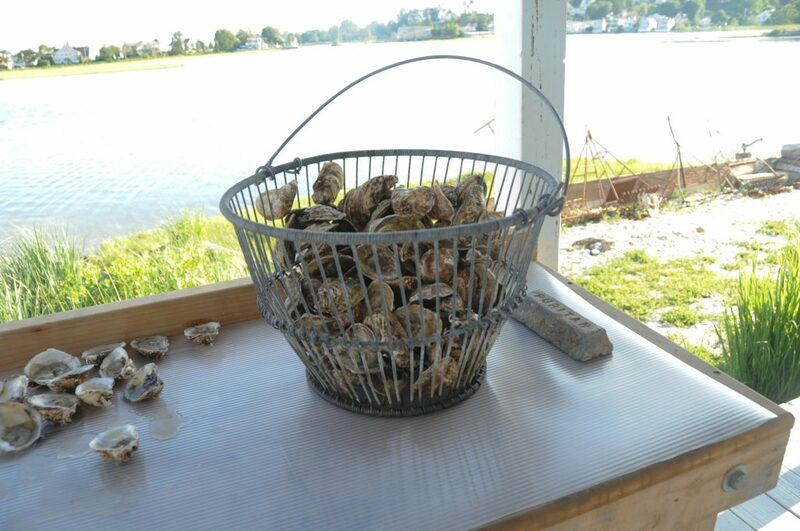 If you’re an oyster lover like us, the view is a bonus while eating oysters right from the source. 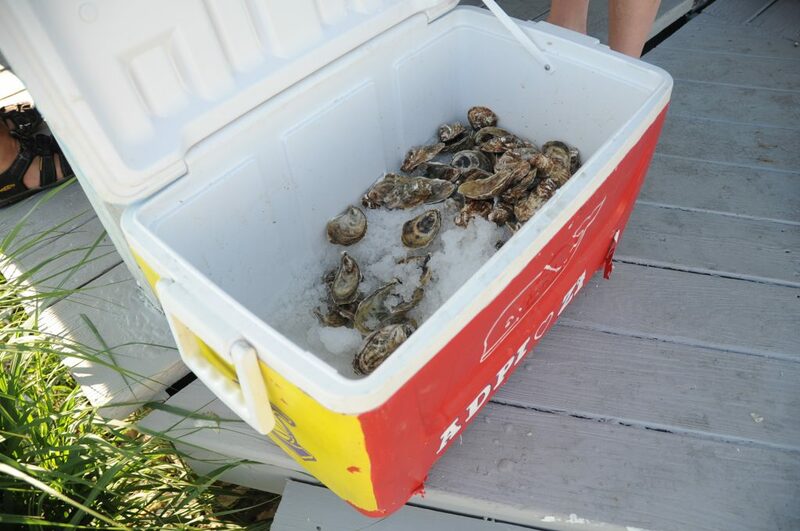 Our tour lasted 1.5 hours and included a boat ride to the island, history of the house and property, overview of current oyster farming techniques, an oyster shucking lesson and a generous supply of oysters on the halfshell. The island is also available for private events. 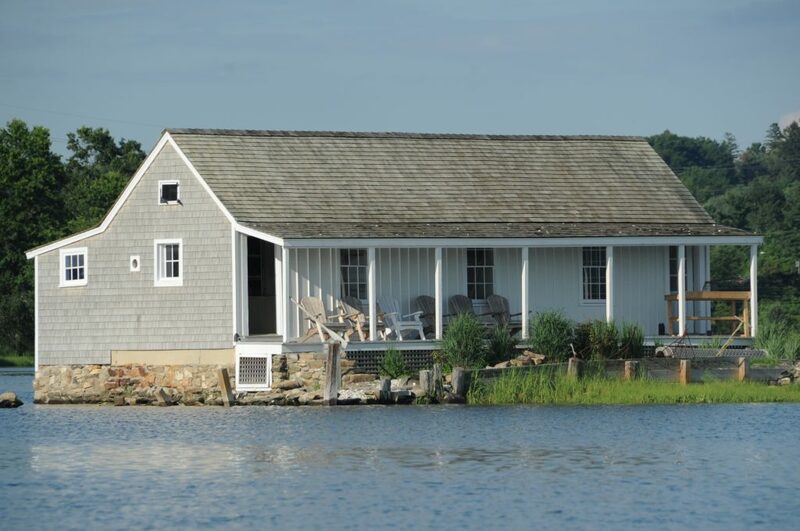 If you’ve ever been curious about the island and house on Sherwood Mill Pond in Westport, Connecticut, this is also your chance to visit this private island and see the restored house. Don’t forget: a hat, shoes you don’t mind getting wet and your cooler (BYOB) + cups. I brought bug spray, but didn’t feel it was necessary. 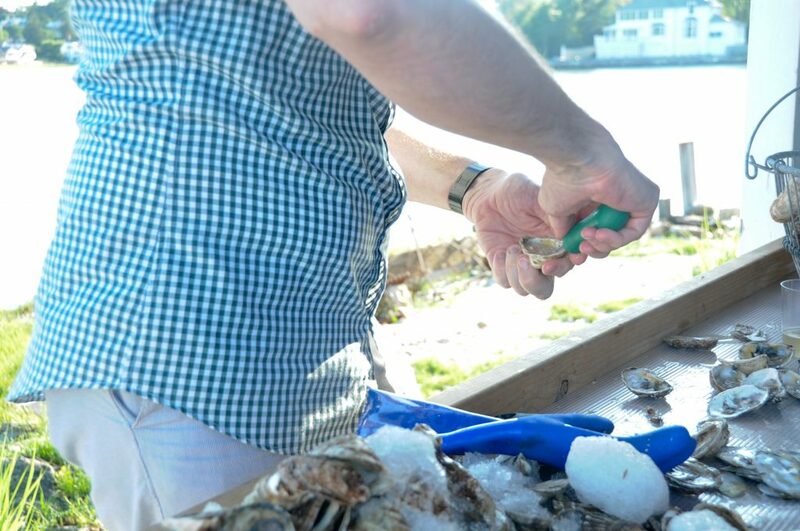 If you like shucking oysters, bring your own knife or there are a few you can use. If you are driving to the tour, parking in this residential neighborhood is limited and even harder if you don’t have a Westport beach sticker. Allow a little extra time for parking, just in case. We were able to grab the last spot on Hillspoint Road.